Download "EMPLOYEE BENEFITS LIABILITY COVERAGE"
POLICY NUMBER: COMMERCIAL LIABILITY UMBRELLA CU 04 03 12 07 THIS ENDORSEMENT CHANGES THE POLICY. PLEASE READ IT CAREFULLY. 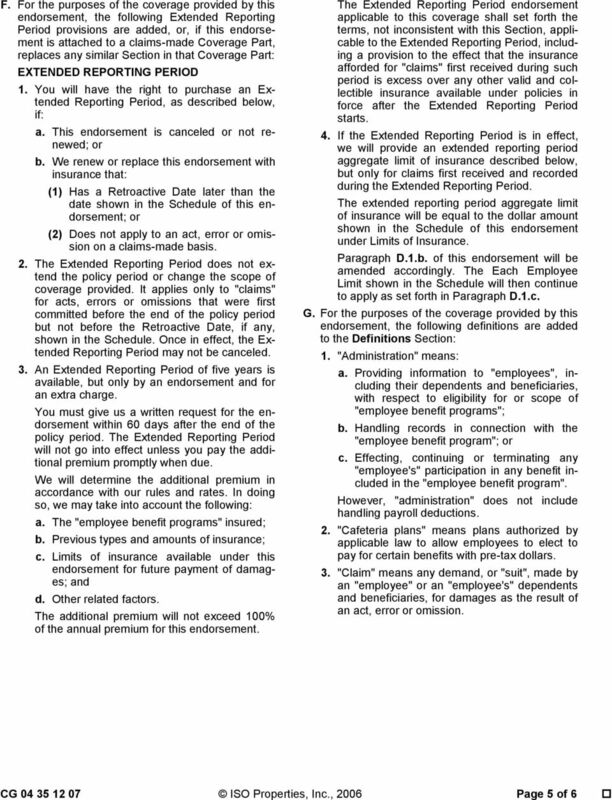 EMPLOYEE BENEFITS LIABILITY COVERAGE THIS ENDORSEMENT PROVIDES CLAIMS-MADE COVERAGE. 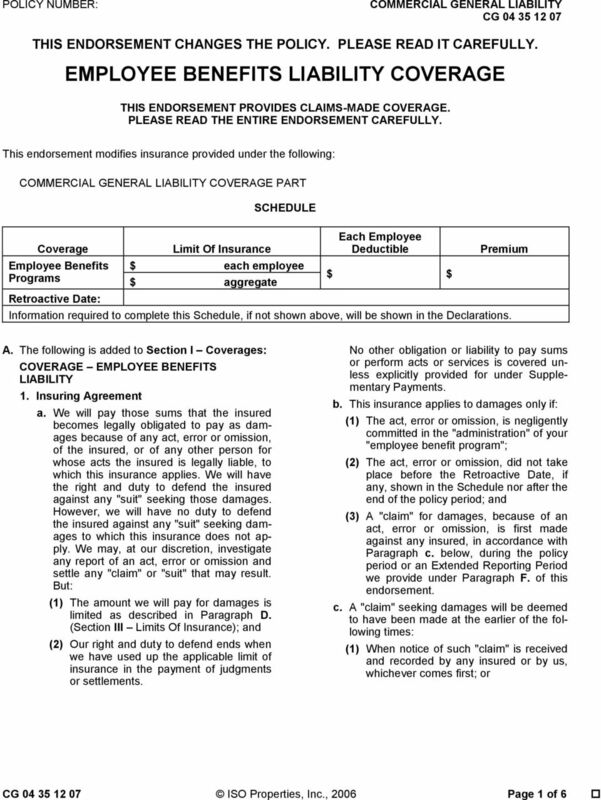 COMMERCIAL GENERAL LIABILITY CG 00 34 12 07 LIQUOR LIABILITY COVERAGE FORM THIS FORM PROVIDES CLAIMS-MADE COVERAGE. PLEASE READ THE ENTIRE FORM CAREFULLY. 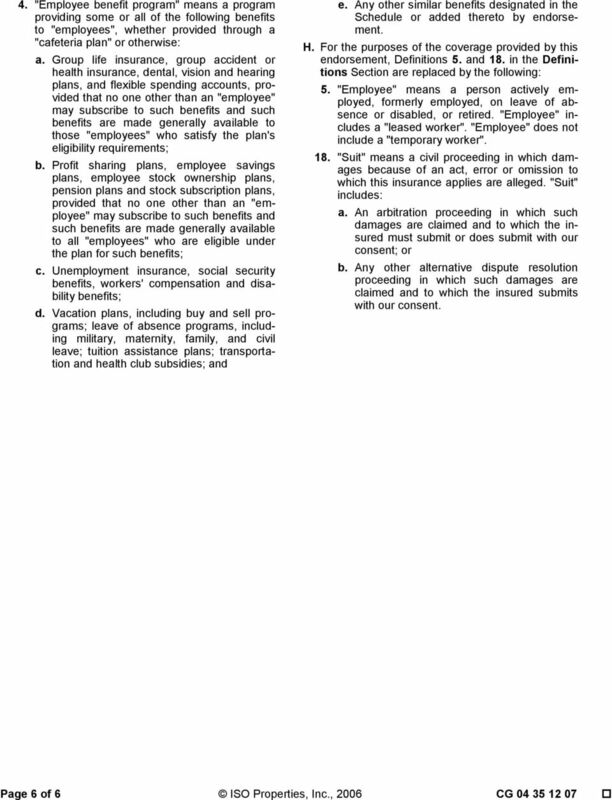 Various provisions in this policy restrict coverage. THIS ENDORSEMENT CHANGES THE POLICY. PLEASE READ IT CAREFULLY. CF-2102 (Ed. 9-15) EMPLOYMENT PRACTICES LIABILITY INSURANCE COVERAGE PART ENDORSEMENT THIS ENDORSEMENT PROVIDES CLAIMS MADE AND REPORTED COVERAGE. 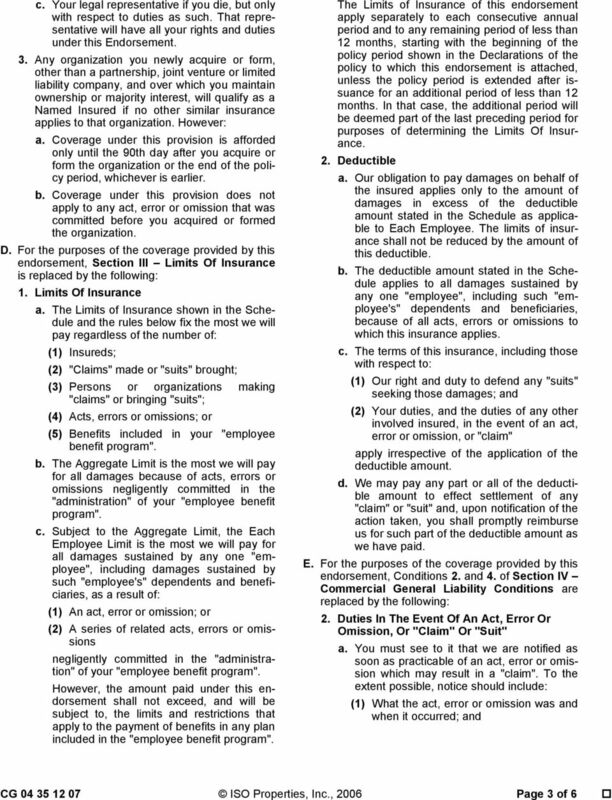 EDUCATORS LEGAL LIABILITY COVERAGE PART DECLARATIONS (Claims Made Form) Policy No. NAMED INSURED: ITEM 1: POLICY PERIOD: POLICY COVERS FROM: TO: 12:01 A.M. standard time at your mailing address shown above. CHECKLIST FOR PURCHASERS OF PROFESSIONAL LIABILITY INSURANCE How to Use this Checklist This checklist is intended as a guide to be used in reviewing professional liability insurance applications and policies. PROFESSIONAL LIABILITY COVERAGE FORM THIS COVERAGE FORM PROVIDES CLAIMS-MADE COVERAGE. CLAIMS EXPENSES ARE INCLUDED WITHIN THE DEDUCTIBLE AMOUNT AND THE LIMITS OF INSURANCE WILL BE REDUCED BY CLAIMS EXPENSES. 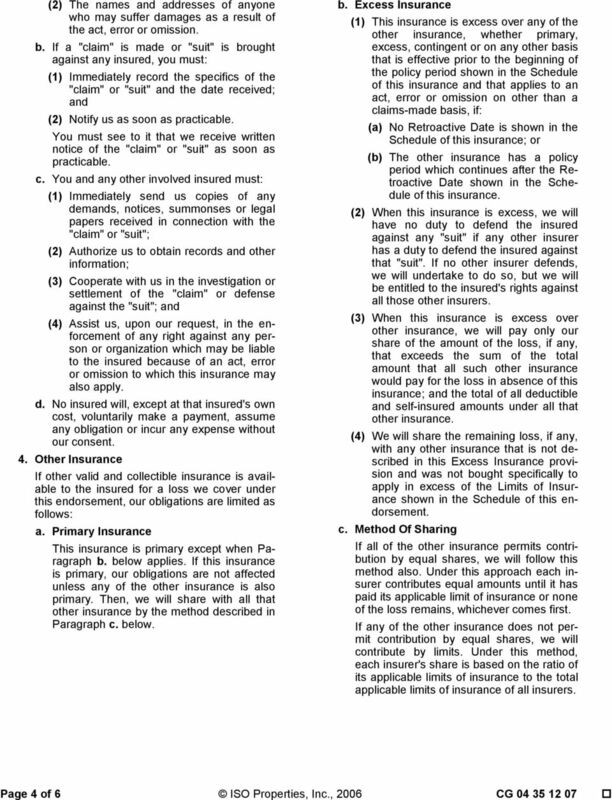 PRIMARY LAWYERS PROFESSIONAL LIABILITY INSURANCE POLICY NOTICE THIS IS A CLAIMS-MADE AND REPORTED POLICY. PLEASE REVIEW THE POLICY CAREFULLY. "Insurance Services Office, Inc. Copyright"
Provided By Touchstone Consulting Group Workers Compensation Employer New Jersey s workers compensation laws determine the benefits available to employees who are injured in the course and scope of employment. 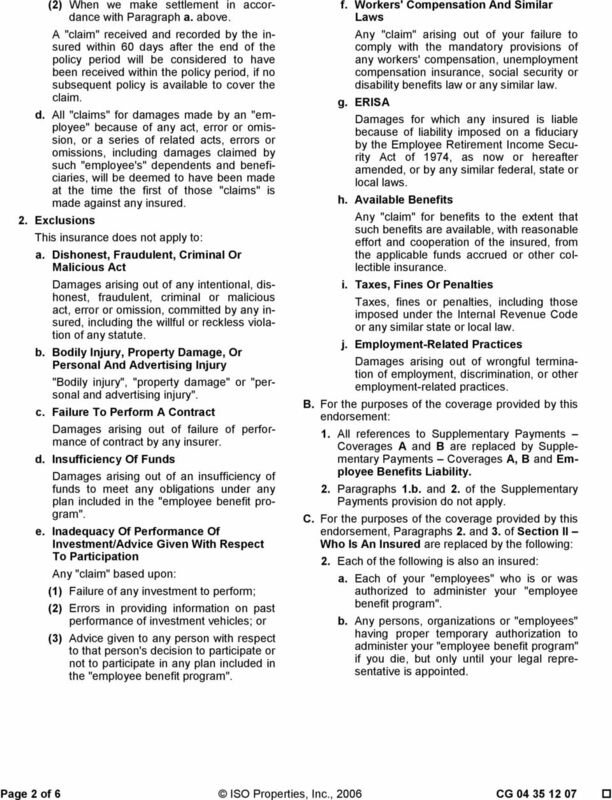 THIS IS A CLAIMS MADE COVERAGE WITH DEFENSE EXPENSES INCLUDED IN THE LIMIT OF LIABILITY. PLEASE READ ALL TERMS CAREFULLY.